Pavement Core Drilling Machine Description: SE-Test India with their apparent contribution in Lab testing equipments has made them prominent manufacturers and suppliers in the market. SE-Test India’s Pavement Core Drilling Machine apparatus (model no. SET-1316) designed as per the required industry standards. This instrument is powered by a petrol/diesel engine. The Pavement Core Drilling Machine is used for the purpose to drill the test scores from or holes in bridges, roads, airport runways, etc. This machine comprised of two vertical support columns with the screwed spindle that help to carry the Drill head/Engine assembly. The 5 Hp diesel or petrol engine with pulley mechanism allows minimum, vibrations. A double precision bit advances with screwed spindle provide an accurate & constant drill pressure along with minimum core chipping and Bit's long life. 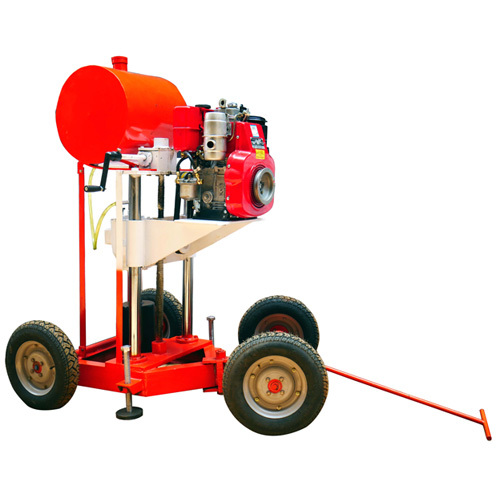 A Pavement Core Drilling Machine assembly is supplied with a strong rigid metal base with leveling facility, which is suitable for doing vertically down coring applications. A Bit Diameter Varying from 25mm to 150mm. A maximum depth of core which can be achieved is 700mm. A 475 rpm & 800 rpm drill speed is supported. A Guide Shaft of 50mm dia. A Screwed Spindle of 20mm dia. A Water Tap of 12mm. Drill Wrenches, Water Tank, and Leveling Pads are included. Comes with 5 HP (horsepower) petrol or diesel engine.